Well I have some exciting news, but I can't tell you yet! You'll just have to check back later. I might not be able to post tomorrow though because my husband said I can't use the computer because he thinks we are going to get some April Fool's virus. I don't know. Maybe I'll go to the library and infect their computer. So I was checking my email (that's when I got the exciting news) and Frances was sleeping in her swing next to me. I was typing away when I heard some noise coming from the ahem, diaper area, if you know what I mean. I thought maybe I should just leave it and finish my email. But then I thought I know I'm new to this mom stuff and I've only been doing it for three months, but that sounded serious. So being the good mom I am I left the computer and brought Frances to her changing table that is currently occupying the middle of my living room. Ladies (and gentlemen?) we had what we like to call in the Eclavea household a LEVEL 3 emergency (a term I heard on the show Malcolm in the Middle that my husband and I now use to let the other know we need help with the diaper changing). So as I am cleaning the little girl up I decide your basic Costco brand wipes are not going to cut it and proceed to lift her off the table and carry her to the upstairs bathroom for a dip in the tub. As I am walking up the stairs (and she is laughing now) I feel something wet on my shirt. Oh yes, she peed on me. And since I was in mid stair climbing there was really nothing I could do about it. Did I mention I have only been doing this for THREE MONTHS? The one thing I have learned as a mom is that you learn something new about being a mom everyday. So lesson #214: Never carry a baby upstairs without a diaper on (or anywhere else for that matter). March 30th tip of the week- Make a card! I started scrapbooking a little over ten years ago now. When I started I strictly made scrapbook pages. I soon found I had a lot of left over paper, stickers, rubons, etc. I put all the extras in a plastic bin thinking I would use them for another page never to be seen again. I was once told by a very talented scrapbooker- Jennifer McGuire (she designs for Hero Arts, Autumn Leaves and other scrapbook companies) to make a card every time I made a scrapbook page (well actually I took a class of hers, so she didn't really tell me personally, in fact I am sure she doesn't even remember it and has no idea who I am). She said while all the supplies are out make a card. I have been doing that ever since. If you think about it, you bought the stuff for scrapbooking, so if you use the left overs to make a card, it's like the card is free. And I can usually make about 3 or 4 cards with my leftover stuff. I call it the "ten minute or less card". And to make it really easy go to a craft store and buy pre-scored cards that come with envelopes. They are super cheap if you look for a sale. Just put some patterend paper on the front, a sticker or two, maybe a rubon and you have a card in ten minutes that you didn't have to pay $3.99 or more for (I swear I can't leave Target without spending less than that on a card) and it looks better than what you would have bought. What kind of card should you make? Well I always need thank you and birthday cards so that is is usually what I make. Sometimes I just make a card with no sentiment and then add what I want later. Depending on the paper, you can usually get away with that. And the best part of making cards with your left over scrapbook stuff? You can use the money you saved to buy more scrapbook stuff! Or save it for something good. That's a good idea. Here is my challenge for you- everytime you make a card put $4.00 dollars away (ok- $2.00 if you usually buy the cheap cards, not that there's anything wrong with that) and at the end of the year buy something really great. Just make sure you tell me what you bought! So no snow came after all! There was just a sprinkling on the grass. I think the suburbs just North got about 4 inches though. So glad it wasn't us! We took Frances to see the Easter Bunny today. She looked so small in his arms. It was so cute. She wouldn't smile at all though, she just sat there staring at me. It was pretty funny. She won't even remember it, but we have the picture to show her. Ok- I couldn't stop laughing. All I kept thinking of was one of those tabloid pictures with the celebrity giving the camera man the finger and in the magazine it is blurred out. How about the caption- "NO MORE PICTURES". I guess it is appropriate. I stalk her like paparazzi. Frances is such a diva already. She tells us when she wants something by letting out this huge shriek. I laugh even though I shouldn't. So cute. Just as it started to get warm here, the snow is coming! Chicago is forecasted to get 6-8 inches tomorrow. Typical Chicago spring. 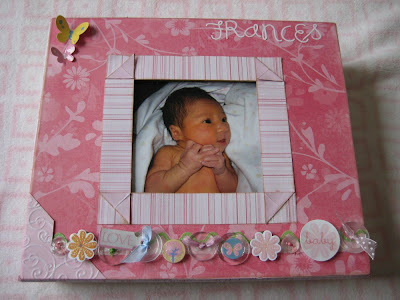 I finally got pictures taken of the keepsake box I made for Frances. It was a box from the Gap that some clothes came in. I looked at it and thought I could do something with it. I used the GCD studios paper. I love that paper! It was perfect for this box, because it wasn't two thin or two thick. And the texture is amazing. The box looks so much better in person. I used mod podge to adhere the paper and then covered the buttons and diecuts in diamond glaze to get them to stand out. I am not sure about the letters still. I will probably change those when I find something better. My next project is to sew a fabric liner in the inside. I think I will sew something and sew her name on the frabic. The best way to adhere it is probably with Beacon fabric glue I am thinking. I will let you know how it works out. I am going to put her hat, t-shirt and braclets from the hospital in it and then add stuff as I collect it. Have a nice weekend. I will be here in all the snow! We are going to try to take Frances to see the Easter Bunny too. Love the new paper out there! Have you noticed that there is some great new paper out there? I have been to Michael's (a craft store near me, if you haven't heard of it) and used my 40% coupon every day of the week so far. My family thinks I am crazy. I am always asking them for the coupons from the newspaper. The lady at the store knows me there now. I went one day last week with two coupons, a bit of a no no I guess and she said I could use only one a day. She let me use two that day, but said next time only one. So I go back when I am out doing errands and buy more paper! So far I have bought 3 packs of GCD studios. If you haven't seen it yet you just don't know what you are missing. I LOVE, LOVE, LOVE THIS PAPER! It is thicker than patterned paper, but thinner than cardstock. Perfect for tearing and foldoing and whatever. And it is shiny and glittery and so, so cute. 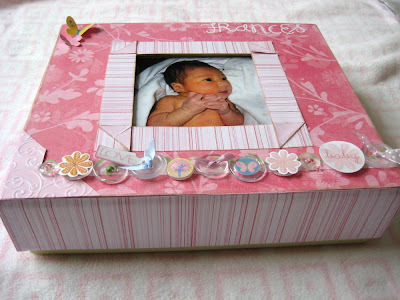 I used it to make a keepsake box for Frances which I will post later and two cute pages. I really like how the Sleepy Angel page turned out and this is one of my favorite photos of Frances. You can't see from the photo, but the paper has little flowers all over it. I thought they looked a little like snowflakes. All the paper on this layout is from the spring pack. The rest of the paper is so cute too. It has little tulips and flowers. I am going to dress Francse up in her little dresses and use the flower paper for those photos. I then made a 10 minute card (I love 10 minute cards) with my scraps. I love the way this card turned out. I think it is so cute. I did all the circle stamping with the new Versamark Dazzle ink. You can't see in the picture, but the circles are shiny. Then I randomly stamped the little flower all over. Gotta love something that takes only 10 minutes! Oh and I used my new Fiskars border punch. I almost forgot about that. The other paper I picked up with my coupon is the Hog Heaven pack by Sassafras Lass. OMG, it is so cute. There are all these little animals on it and some doodled clouds and rainbows. Adorable. I used it to make a layout of Frances on her first trip to the park. I put her in the swing and she just cried and cried. I love this picture because she looks so tiny and mad. I should have waited 2 more minutes to take her picture when she was SCREAMING. That would have been fitting for the layout. And of course while the supplies are out you have to make the ten minute card. And this one only took me 5! It is so cute, I love it! 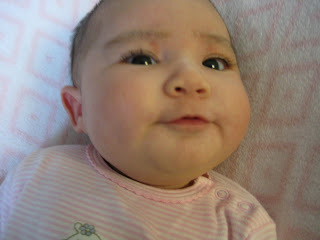 Oh yeah- And Frances is three months old today! Happy Birthday Frances! A little background information about this story- I love monkeys. I think they are adorable. Put a monkey in a diaper and it is even more adorable. Put a monkey in a onsie and it is off the cuteness scale. I just want to pick it up and hold it and squeeze it (and hopefully not get hepatitis in the process). So when Frances was born she had hair all over her body. I mean lots of hair. On her back, arms, legs, head, everywhere. I thought- I did it. I gave birth to a monkey. It must be because I love monkeys so much. 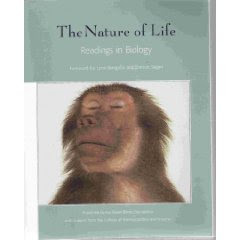 Everyone thought it was very fitting that Frances looked like a monkey because of my fascination with them. Just a little resemblence right? I love this picture of her! She moves so much though every picture of her has the head cut off. I don't care in the scrapbook it goes! If you love it, scrapbook it! I hate when I see in magazines that pictures that are not perfect can not be used in scrapbooks. Some of my favorite pictures are blurry or have a head cut off! Well life isn't perferct and Frances moves. A lot. If I waited for the perfect picture I would never scrapbook. And I don't have time to set up a professional photo shoot for every photo I take. So my tip to you is- If you love it scrapbook it! Some of my favorite pictures are not perfect. When Frances was two months old I took this photo of her in her little diaper and she kept moving her arms around so her arm is a little blurry which I love. It shows her personality. When I got it back from the phot place her head was cut off a little, but I love the photo still. So I used it for her two month page (Umm, I don't have a one month page yet though, it's in the works) and I love the way the page turned out. I used the new Little Yellow Bicycle Baby Safari line of paper. I love all the colors and all the little animals. It is so cute! I used a lot of layering to give it some dimension.